The mother didn't receive support in the 1970s. 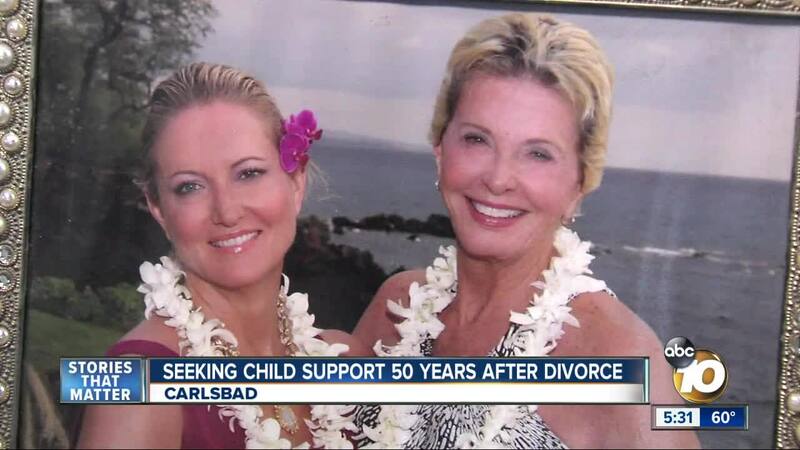 CARLSBAD, Calif. (KGTV) - A North San Diego County woman is suing her ex-husband for child support for their now 52-year-old daughter. Toni Anderson makes no apologies for going after the man she calls her "deadbeat ex" some 50 years after he left her with their 3-year-old daughter. "I kind of put it on the back burner and just kind of forgot about it over the years," said Anderson. She supported her daughter while working as an interior designer in Los Angeles at a firm her daughter now runs. "I'm not negating the fact I was able to send my daughter to college, Paris. We traveled and had a good time. But the money runs out." Anderson admits she rents her part of the house. And now that she's retired money is tight. Then it dawned on her. "I realized in the middle of the night one night last year, 'Hey, there's no statute of limitations on child support.'" Anderson looked up old court papers and last month notified her ex-husband, who's now living in Oregon: she wanted him to pay up. But the amount she was seeking now was way beyond what he was asked to pay nearly a half-century ago. "He was only supposed to give me like a 160 dollars a month. Well, that was 50 years ago. That today is a lot more money." "I don't think enough women get this. And I think they're afraid." Along with getting what she's due, Anderson wants to spread the word to other single parents in California: You can still collect. And to those who skipped out, her message is for them to watch out. Toni Anderson's lawyer, Sara Yunus, Esq., an Associate Attorney for Antonyan Miranda, LLP, tells 10News a private hearing in Vista Court Wednesday resulted in a settlement of $150,000. 10News also reached out to her ex-husband's attorney. There has been no response.